By default, when text contains numeric values, those values are displayed using Latin (European) digits. When other Unicode digit shapes are preferred, use the java.awt.font.NumericShaper class. The NumericShaper API enables you to display a numeric value represented internally as an ASCII value in any Unicode digit shape. The following code snippet, from the ArabicDigits example, shows how to use a NumericShaper instance to convert Latin digits to Arabic digits. The line that determines the shaping action is bolded. The NumericShaper instance for Arabic digits is fetched and placed into a HashMap for the TextLayout.NUMERIC_SHAPING attribute key. The hash map is passed to the TextLayout instance. After rendering the text in the paint method, the digits are displayed in the desired script. In this example, the Latin digits, 0 through 9, are drawn as Arabic digits. The previous example uses the NumericShaper.ARABIC constant to retrieve the desired shaper, but the NumericShaper class provides constants for many languages. These constants are defined as bit masks and are referred to as the NumericShaper bit mask-based constants. You can query the NumericShaper object to determine which ranges it supports using either the getRanges method for bit mask-based shapers or the getRangeSet method for enum-based shapers. The Range API requires JDK 7 or later. The Range API covers more Unicode ranges than the bit-masked API. The bit-mask API is a bit faster than the Range API. The ArabicDigits example was designed to use the shaper for a specific language, but sometimes the digits must be rendered according to the language context. For example, if the text that precedes the digits uses the Thai script, Thai digits are preferred. If the text is displayed in Tibetan, Tibetan digits are preferred. The first two methods use the bit-mask constants, and the last two use the enum constants. The methods that accept a defaultContext parameter enable you to specify the initial shaper that is used when numeric values are displayed before text. When no default context is defined, any leading digits are displayed using Latin shapes. The first layout uses no shaper; all digits are displayed as Latin. The second layout shapes all digits as Arabic digits, regardless of language context. The third layout employs a contextual shaper that uses Arabic digits. The default context is defined to be Arabic. 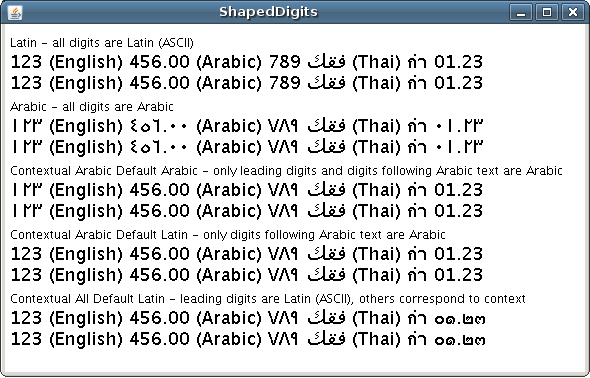 The fourth layout employs a contextual shaper that uses Arabic digits, but the shaper does not specify a default context. The fifth layout employs a contextual shaper that uses the ALL_RANGES bit mask, but the shaper does not specify a default context. See the ShapedDigits.java example for further implementation details.